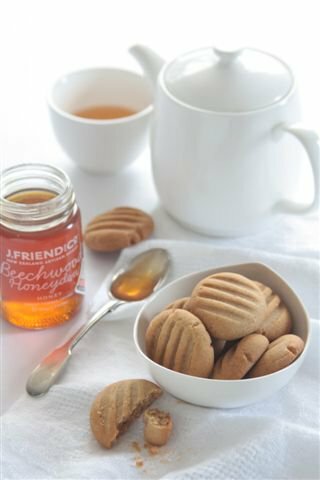 The weekend… just perfect for baking cookies to warm the kitchen and fill the house with the lovely perfume of honey and spice! 1 Preheat oven to 180°C. Sift dry ingredients together and set aside. Melt butter in saucepan large enough to hold the whole mixture. Add honey and sugar. Stir to blend until sugar is dissolved. Set aside to cool for 10-20 minutes in the fridge until just warm. 2 Stir in buttermilk to combine. Add sifted dry ingredients and mix well. Shape into 3cm balls. Place on baking trays lined with non-stick paper spaced apart to allow for spreading. Press with tines of a fork. 3 Bake for 15 minutes or until lightly browned. Remove to a wire rack to cool. Delicious! This entry was posted on July 30, 2017 by julieleclerc.